Dargan coming down after the interception against Wyoming. Dargan went from being a small part of the Ducks defense to leading the team in interceptions with seven. 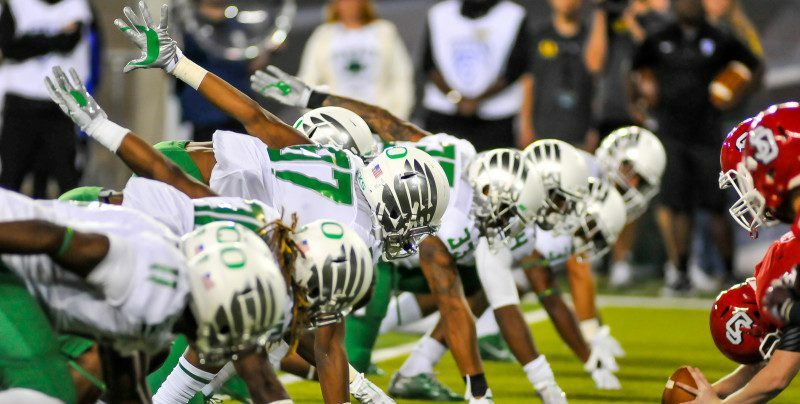 Although Dargan had a stellar year and was a crucial part of the Ducks making the National Championship, apparently – to some — that wasn’t enough, as he was snubbed from the 2015 NFL Combine. Dargan is seen by many scouts as not having the breakout speed that is required to play at the next level or the ability to come up and stop the running back in the hole. Dargan showed up to his Pro Day at a solid 5’11”, 211 pounds. He ran a somewhat slow 40 at 4.72 and had a vertical jump of 29″. With all that being said I still believe Dargan can be solid back up safety in the NFL if he continues to improve his speed, so look for him to go in either round 6 or 7. 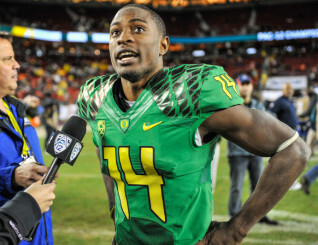 Ekpre-Olomu talking to reporters after the PAC-12 Championship Game. Most of the season played out in Ifo’s favor, as the Ducks were looking good heading into the first CFB Playoff Semi-Final game against Florida State. 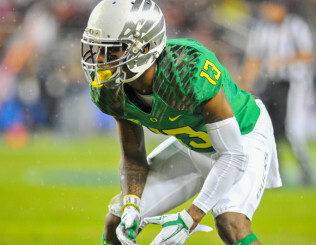 Then in a practice leading up to the game Ifo Suffered a Torn ACL, which was a blow to him and the team. But the consensus all-American, first-team all-Pac-12 and Jim Thorpe Award (top defensive back) finalist is ready to move on and look to accomplish his dream of playing in the NFL. He wasn’t able to participate in the NFL Combine or his Pro Day, which could hurt his draft stock along with recovering from the knee injury. With all these factors facing Ekpre-Olomu with the Draft just a couple of days away, I still think Ifo is a can’t miss player at his position, so expect him to go between rounds 3-4. 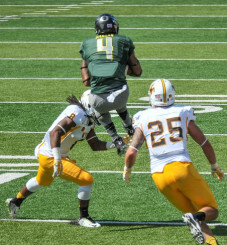 Hill waiting to jam a receiver during the PAC-12 Championship. Hill had the breakout season he wanted last year after finally becoming a full time starter for the Ducks, as he led the team in pass break ups with 18. Hill was the only one of the Ducks secondary to participate in the Draft Combine in which he ran a 4.55, 40 and had a vertical jump of 34″. Hill has great footwork, hands, and plays very aggressive, which sometimes works for or against him. The one thing holding Hill back from being considered an elite corner in this Draft is his size. Hill’s stature, 5’10”, 180 lbs., is why some scouts think he won’t be able to withstand the physicality of some wide receivers and big bruising running backs. Hill still has the speed and technique to have a nice career in the NFL, expect him to go between rounds 4-6.